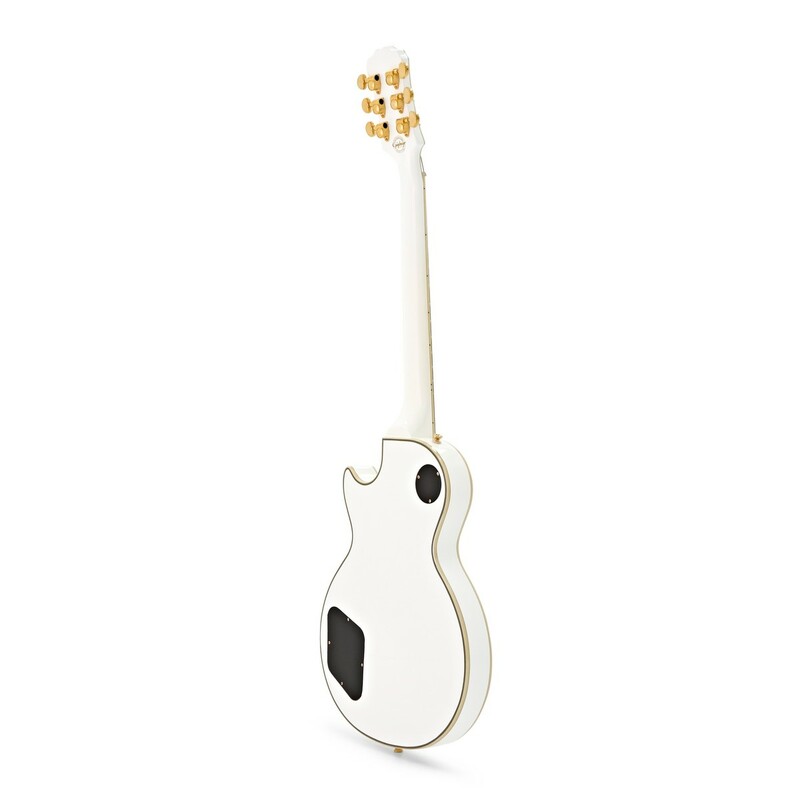 The Epiphone Les Paul Custom Pro, Alpine White is an iconic and visually stunning solid-body electric guitar, that allows you to experience the legendary tone at a more affordable price. The Les Paul Custom Pro is crafted with a mahogany body, which delivers rich, full-bodied tones with plenty of resonance. The mahogany is also topped with a maple veneer for enhanced brightness and ringing sustain. The ProBucker ''PAF''-style humbuckers produce a vintage sound with a warm low end and sparkling highs, while the coil-spitting provides outstanding versatility. The smooth mahogany neck is paired with rosewood fingerboard with a slim and ergonomic profile which helps to ensure comfortable playability and an authentic feel. 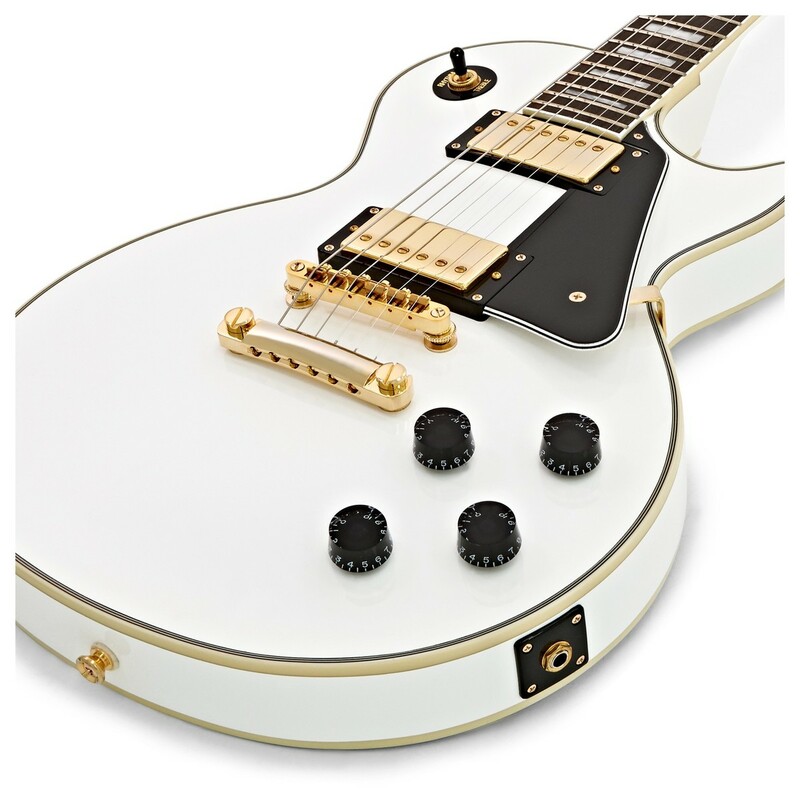 Complete with a sleek Alpine White finish, 3-layer white/black pickguard, split-diamond pearloid headstock inlay and classy gold hardware, the Les Paul Custom Pro really does look as amazing as it sounds. Loaded with a pair of Epiphone Pro-Bucker Pickups, the Custom Pro produces that iconic and recognisable Les Paul sound. The pickups consist of a Pro-Bucker-3 at the bridge and a Pro-Bucker-2 at the neck; and these pickups deliver balanced tones with rich, full lows and tight sparkling highs. The Pro-Bucker Pickups feature Alnico II magnets, and they are hand-wound to provide a PAF-Style sound with added bite and grind. Each pickup features coil-splitting via the push/pull control at each pickup’s volume knob, which gives the Les Paul Custom Pro even more versatility, to shape your own ideal sound. The volume and tone controls feature 500K Ω potentiometers and with Epiphone’s rugged, all-metal, 3-way toggle pickup selector switch you can be sure of long-lasting performance. The mahogany body gives the Les Paul Custom Pro a warm and resonant tone with great sustain, as well as plenty of depth. Mahogany delivers good levels of grind and bite, which works exceptionally well with punchy rock music. The mahogany body also provides durability, and a tone that will mature over the years for a long lasting investment. The mahogany is topped with a maple veneer, which extends the mahogany's tonal range with enhanced brightness and sustain. The body also features 5-ply white/black binding around the maple top and single-ply cream binding around the body for that added vintage appearance. The Les Paul Custom Pro's neck is made from beautiful mahogany which is sturdy and provides good durability. The mahogany gives the guitar a richer focus, with warm and full undertones; and it is coupled with an equally as warm rosewood fingerboard, ideal for creating articulate tones that are soft yet punchy. 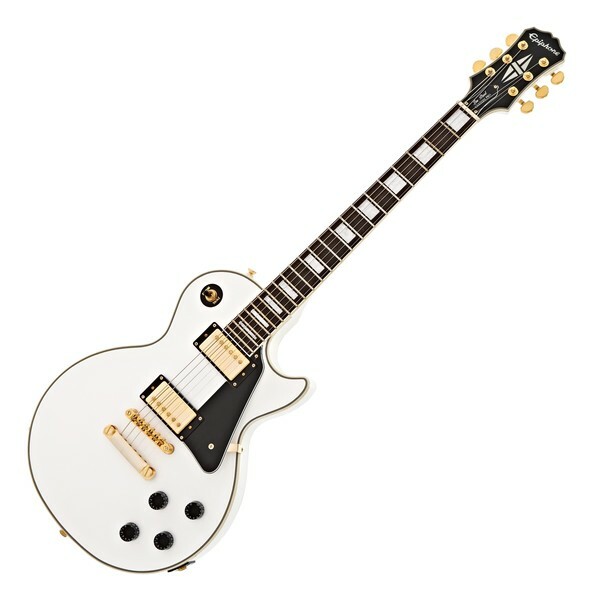 The Epiphone Les Paul Custom Pro is equipped with rock solid hardware, consisting of a Locking Tune-O-Matic bridge and StopBar tailpiece which is fully adjustable. They are locked in place, which works to keep your tone reliably in tune, and improve sustain. There are also Grover 14:1 Tuners onboard for stability, and the metal 3-way toggle switch ensures years of sturdy use and performance. The Les Paul first entered the world in the early 1940s, when the legendary guitarist created the world's first solid body electric guitar that was known back then as 'The Log'. Historically Les Paul's have been used by some of the most legendary guitarists the world has known, players like Peter Frampton, Pete Townsend, Jimmy Page and Marc Bolan to mention a few. Now most notably used by the likes of Slash and Black Label Society's Zakk Wylde and Green Day's Billy Joe Armstrong. 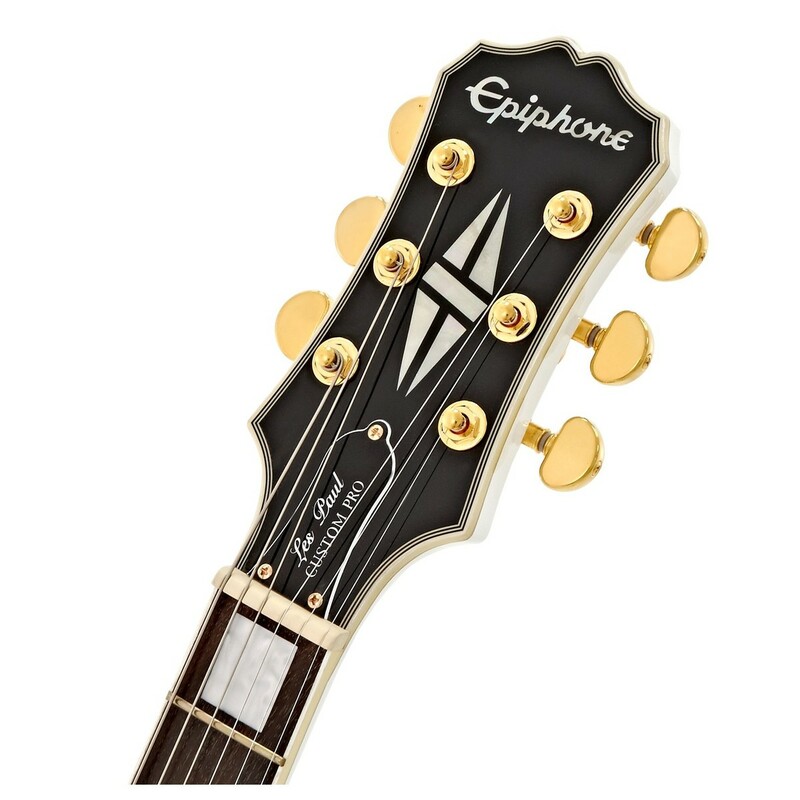 Epiphone combines tradition, value and innovation to produce Les Paul Guitars that both look and sound unbelievably close to their Gibson counterparts, at a more affordable price. The Les Paul Custom made its debut in 1954 after the initial success of the Les Paul Goldtop. 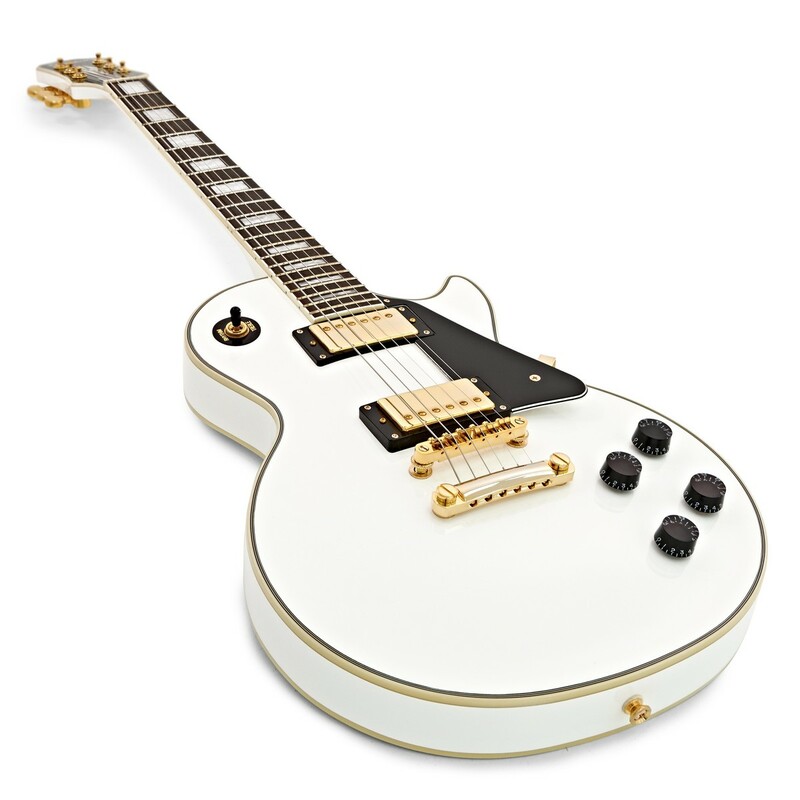 Les Paul requested a custom color finish in solid black and solid white with gold hardware; with the intent of a guitar that would blend well with a tuxedo. The Les Paul Custom became one of the most recognisable guitars in the world and even Les himself used his Les Paul Custom on stage.